Last week Mr B had a few days off so on Friday we decided to take the kids swimming. Due to the age restrictions I can’t take all 3 on my own, so with Mr B being off I thought it would be a good idea. I feel really guilty that this is the first time that Little D has been swimming. It’s really awful how time slips away and before you know it months or years have gone by and you haven’t done things you’ve wanted to. Anyway, at first D was hanging on to his Daddy for dear life, his little chin wobbling with fear and generally just unsure of what the hell was going on. I had Miss C for the first wee while then we swapped and I took him deeper in the water and bobbed him about a bit and he was soon splashing, sticking his face in the water, playing with his sisters and constantly kicking me in the stomach. Miss C was actually buzzing out of her tights! It’s been over 18 months since she’s been (bad Mummy) and she loved it. The kid has no fear. It’s brill but scary.I’m glad she’s like that though, and I’m going to enrol her in swimming lessons as soon as she is old enough. Being able to swim is such a life skill that I think it’s really important that kids learn as soon as they can. I was also told by the Physiotherapist that swimming could help to strengthen her muscles and help her hypermobility so I really want to try and take her more often and help those wee bendy ankles, knees and hips. 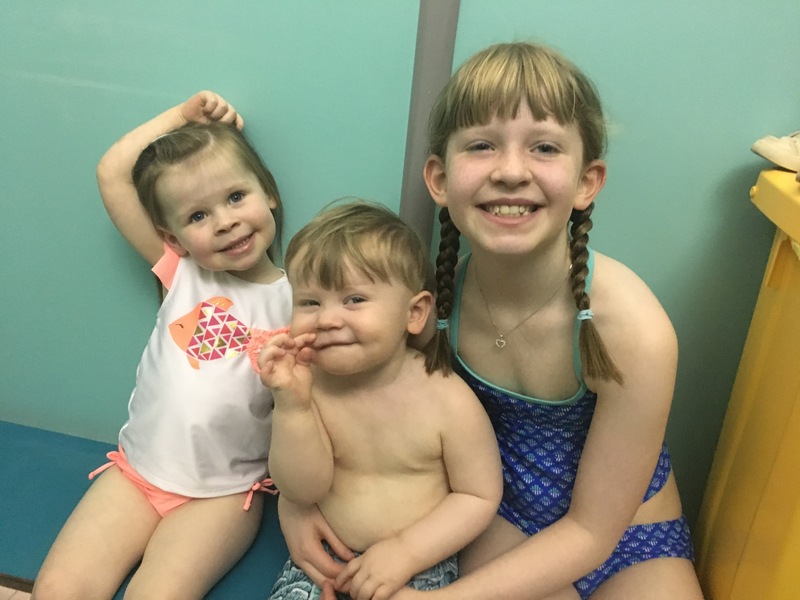 Miss B started swimming lessons in 2012 and she is amazing. She is almost finished all the levels and her couch was talking to her about starting the junior lifeguard programme which she is quite keen to do. She has a lot of activities so we will need to have a look and see what it involves and where she can fit it in. I can tell you though that taking 3 kids swimming was so tiring. Just getting the 2 wee ones out of the pool, showered, dried and dressed was mental. We went at 9am and it was quiet, so no lack of family changing room or showers and everyone was shattered afterwards that we had a really chilled afternoon.